One year ago this week, Aaron’s 94-year-old grandmother passed away. Laura Belle was one of my favorite people. In addition to being spry and fiesty, she had a wonderfully sunny disposition that always seemed to draw crowds. Laura Belle was an accomplished quilter and many of the bed coverings in our house bear the marks of remnant fabrics she scavenged from textile mills near her home in rural Alabama. Her quilts demand another post entirely, one that may come before too long; this post needs to be about her knitting. When she moved to an apartment and stopped quilting, Laura Belle turned to knitting and crochet to keep her hands in shape. Her most recent project was to knit full size afghans for each of her children, grandchildren and great grandchildren. When she was dying, she expressed regret over not finishing the last afghan. As the only knitter in the family, I promised her I would complete it. This is where you and I begin. Laura Belle had finished just about three of seven or eight pattern repeats when she died, although her last few rows were pretty rocky. I could tell she had really tried to finish but her mind was not in it. Knowing how she would have scowled at aberrant cables and mistakenly purled stitches, I considered ripping out her last few rows and re-knitting them. I let them alone only because I knew how hard they had been for her to knit. Some family members wanted me to put a line of contrasting yarn where her work ended and mine began, a task that struck me as too morose. I began knitting where she left off, which is what I think she would have preferred. 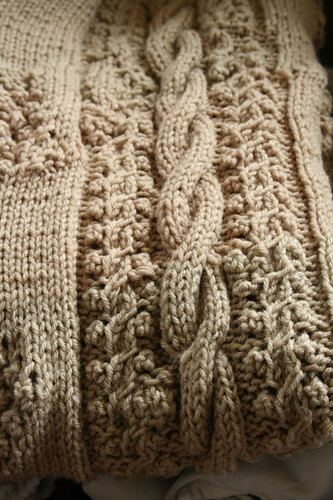 The pattern itself was cobbled together from a collection of cabled stitch patterns she liked. To my horror, Laura Belle had written the pattern out line by line with no cable chart. Leafing through tens of pages of handwritten instructions, I found some interesting margin notes that filled out what else was happening in the background as Laura Belle knit. Sometimes, she jotted down a word with its definition, as if she had learned its meaning in a book or in a conversation as she knit. 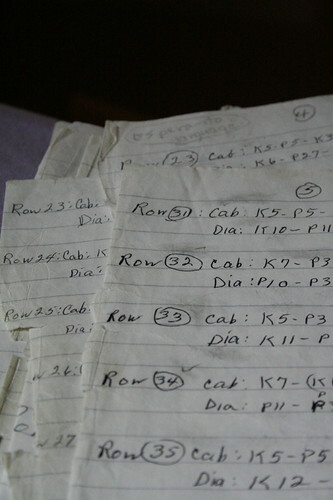 Other times, she wrote down phone numbers or the ages of someone’s children. 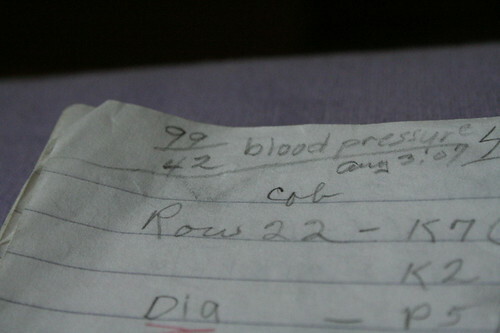 Here, she had written a blood pressure reading, dated a few weeks before she died. 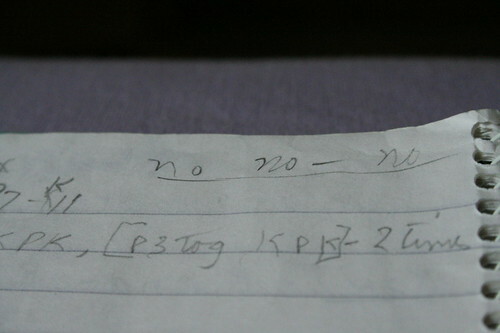 “No no-no”. Does it refer to the pattern? Is she warning herself about a difficult section? Or something unrelated to knitting? I will never know but always wonder. I finished the afghan, although I stopped at five pattern repeats instead of the seven or eight that Laura Belle had planned. I would have liked to knit it to full size but for the sake of family peace and because non-knitters have different project timelines than knitters, I ended it early. I am sure she would be happy to know that her last afghan is currently in transit to its designated recipient. This was a hard project to work on because the knitting made me sad. Casting off her last project seemed to be my duty as a fellow knitter, as if there were some unspoken code of ethics in the craft. 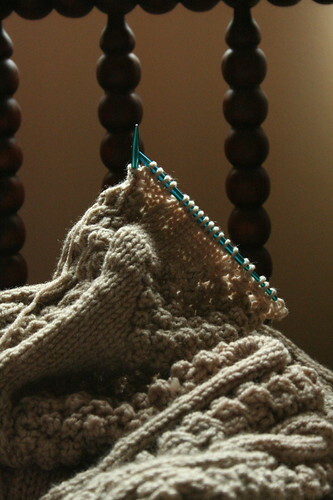 After all, who does not feel trapped in knitting purgatory as unfinished projects mount? 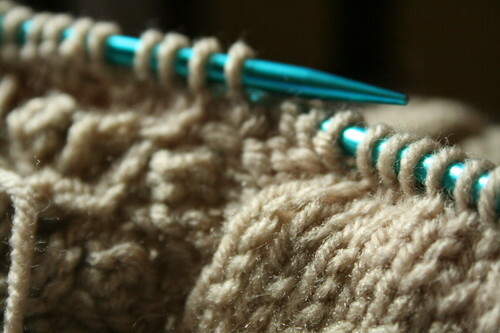 As knitters, we should all have someone to complete our works in progress when we die. 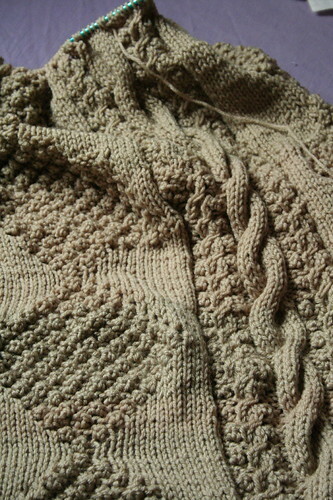 Even though I felt sad knitting this, the satisfaction of binding off was great. I know Laura Belle too would be relieved to know it was done. 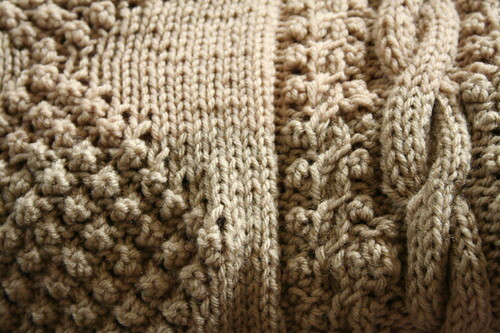 Hooray for finished sweaters! 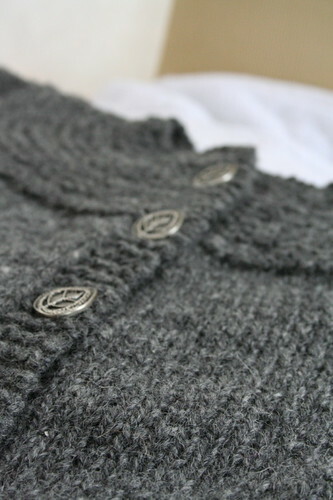 Sadly, this is the first sweater I have finished since my Central Park Hoodie in June! 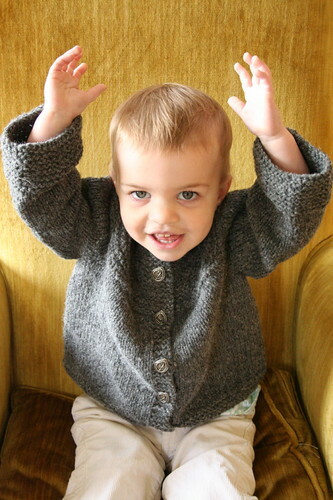 This darling little sweater is not for Beatrix – it is a birthday present for B’s very first friend, Asa. The kiddos were born two weeks apart and Mr. Asa is about to celebrate his second birthday. I actually bought this yarn to swatch Aaron’s Aran but since I settled on Ram Wools Selkirk for that project, I had a whole skein of Harrisville Highland leftover. I intended for this to be a stash busting project but of course, I ended up needing a second skein! 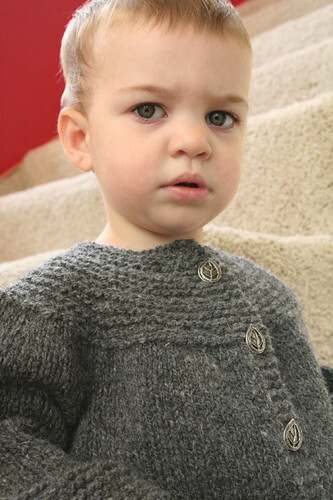 For the record, I made EZ’s 5 sts/in gauge and the sweater fits my two-year-old. EZ was fond of saying a baby sweater will fit eventually but I admit I think that’s a bit of a cop out – I want a general idea of what year in the child’s life the sweater will fit. Is that too much to ask? Luckily, I did the math before embarking on this project to determine the proper fit. Right. Just as I suspected. Luckily, the owner of my local fabric store (where I bought the buttons) sent me home with a half yard of twill tape to sew onto the back of the button band. 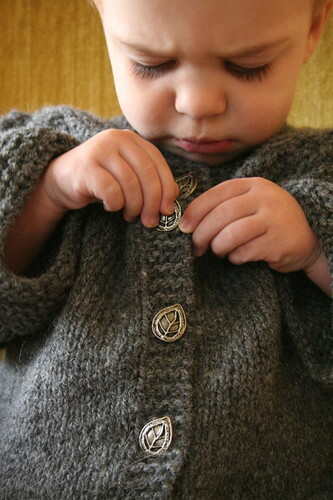 She agreed that metal buttons were a must for a little boy’s sweater and she assured me that the tape backing would provide support for the buttons and relieve most of the stress on the yarn. Only “a little hand sewing” was required. What? 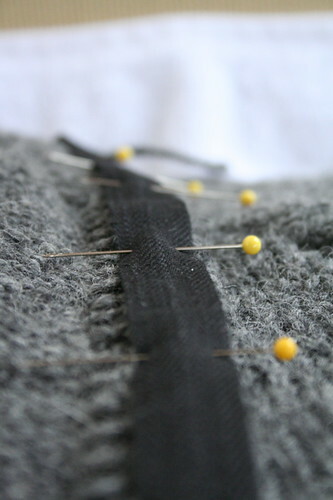 Hand sewing? 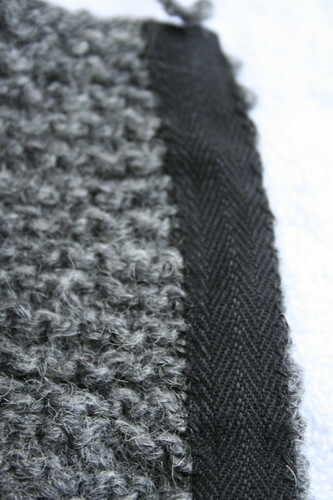 I dread hand sewing fabric to a knitted garment; the resulting product always appears sloppy and flimsy. Nevertheless, I dutifully pinned the tape to the back of the buttonband before skeptically stitching it by hand. And to my shock, it looks great! Most importantly, I think those buttons are now able to withstand the abuse of a two-year-old. Beatrix agrees. That is a look of pure toddler annoyance.